As a boy, Aaron Falk fled his Australian country town of birth with his father, chased by scandal and disgrace. Years later, Aaron’s best mate from those days has apparently committed suicide after killing his wife and child. Aaron has been asked by the grieving family to return for the funeral and to investigate the matter. Aaron reluctantly returns, facing his own demons and old lingering suspicions of the town. The countryside is in the grip of fierce drought, and tempers are flaring with the combustible tensions amongst the locals. 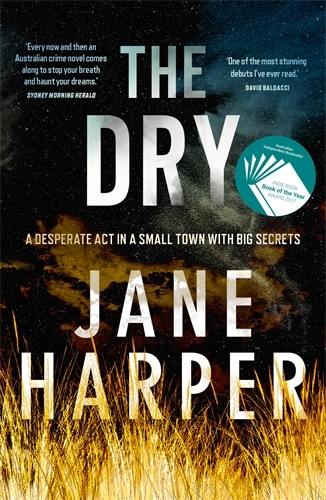 Jane Harper has written a cracking debut novel, rife with the heated atmosphere and deadly gossip of a small town in crisis. The parched fields and cracked weatherboards of the town are their own entity, and you emerge from reading needing to crack a coldie. When your first novel is praised by the likes of David Baldacci and Michael Robotham, you are off to a flying start. The character of Aaron is so well drawn, the reader hopes to hear more of him after the novel reaches the flammable climax and resolution.